Cleaning a restaurant exhaust system typically involves washing the exhaust fan, ductwork, filters, and hood. Using hot water is highly recommended. Each section of the system should be washed using a method that reduces the need for clean up after finishing. Prior to any cleaning, steps must be taken to prepare the area for washing. Hood filters and the drip tray are removed as a first step. Set these items aside to clean later. Heavy plastic sheeting is attached to the edge of the hood, providing a tented in area all the way around. The plastic sheeting protects the cooking equipment from runoff and confines the area affected by the runoff. Care must be taken to be sure the plastic won’t allow water to run onto the cooking equipment. Spring clips are usually used to attach the plastic to the hood. The plastic should start and end where it is possible to lift the plastic edge to step inside the plastic tent. The edges should overlap two or three feet to provide a good seal. If there are any hot cooking surfaces the plastic must be kept away from them. 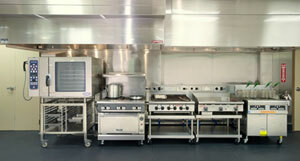 Small plywood sheeting sometimes comes in handy to cover certain equipment like the range top and fryer. Once the tent is installed the bottom edge of the plastic can sometimes be directed into a plastic garbage pail for water collection. Otherwise a vacuum person should be stationed outside of the tent to vacuum up water as it runs out from under the plastic. A large capacity wet dry vacuum should be used for this purpose. Wastewater generated during the cleaning project is usually disposed off in the grease dumpster. Prior to proceeding make sure electrical power is shut off to the exhaust fan and won’t be restored until the job is done. Most exhaust fans are roof mounted. The fan is screwed onto the ductwork. The first step is to unscrew the fan from the ductwork and then lift or tip it off the duct and rest it on the roof. Exhaust fans should have enough electric cable to allow you to do this. Next apply chemical to the fan and to the inside of the ductwork. After the chemical has been applied and allowed to dwell as recommended on the product label, pressure wash the fan and then the ductwork. If using the vacuum method let the vacuum person know when you are going to start washing the ductwork. After washing is complete, replace the fan onto the ductwork and fasten it down. Rinse off the roof area where you have been working and then head down to the kitchen. Sometimes exhaust fans are mounted on an outside wall with the hood directly on the other side. An installation like this can usually be cleaned without removing the exhaust fan. If there is ductwork to clean on a wall mounted system, access must be gained either from the hood end, through access panels, or by removing the fan from the wall. Apply cleaning chemical to surfaces using a direct spraying system, either compressed air or electric. We recommend the use of Hood Pro, which while being non-caustic, is an excellent degreaser. This product is safer to use than caustic chemicals. The filters are usually cleaned either off site or outside. Soak the filters with chemical and then power wash. Some companies actually have extra filters and they replace the dirty filters and bring them back to the shop where they are degreased in a soak tank. This tank contains concentrated Hood Pro and works best when operated with a circulator pump to move the chemical across the filters. Others use disposable replacement filters and simply put new ones in and throw away the old dirty ones. The drip tray should be washed in the sink and then replaced. Chemical is applied to the inner hood surface and allowed to dwell. It is then pressure washed off. The channel formed where the lip holds the filters in place should be wiped out with a towel. After washing the inside of the hood, carefully wipe water drips from pipes and light fixtures. The outer sections of the hood are usually cleaned by hand with towels after the inside is completed and the plastic tenting is removed. Use a towel that has cleaning chemical on it, then wipe with a towel that is soaked with clean water. Stainless steel cleaner used as a last step makes the outside of the hood look great. This is the section that the restaurant owner sees first and because of that it is what causes the most complaints. Another source of complaints is the general kitchen area. f the runoff isn’t properly contained and the kitchen isn’t cleaned you will get complaints. After the entire cleanup is completed, test the fan. This protects you from being blamed for problems that may arise in the near future and if there is something wrong it also gives you the opportunity to make it right. Record that the fan was tested and that it operated properly on your invoice so the customer can see you checked everything. Many companies apply a sticker to the hood recording when it was cleaned. The sticker should also provide your company name and phone number, as well as the next recommended cleaning date.